Let us never forget that government is ourselves and not an alien power. The ultimate rulers of our democracy are not a President and senators and congressmen and government officials, but the voters of this country. Today, you are going to be replaced by our new President. Despite of what some people think about you, I would like to thank you for everything you've done in the last 10 years. 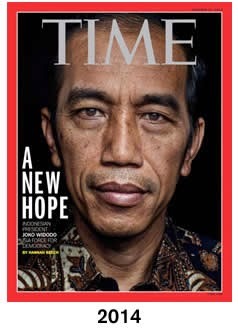 I am pretty much sure that it is not easy to lead a huge country like Indonesia, so that's why, when people talk sh*t about you, just simply ignore them. Thank you very much! Start from today, you are going to be our new President. Congratulation. People put their hopes on you, they said you are going to bring fresh air to this country. Good luck on leading us for the next 5 years. Good luck on carrying this huge responsibility. I am not one of your fan, but I will support whoever it is who can bring a better future for this country. So, good luck!